The state-of-the-art online assessment tool that identifies a person’s decision making, job strategy, and work priorities. The Sommer Survey represents the next generation and a new breed of assessment tools. From decades of technological success, our reports provide decision makers with an in-depth, actionable window into how a person thinks through their job responsibilities. People are unable to articulate their strategy on their own. The reason: it happens lightning fast at the person’s automatic level of language processing. Decisions are driven by linguistic processes. The result: Our reports give decision makers significant advantages in managing their teams. We offer you greatly enhanced insight into how your people are thinking. You will know what you can do to manage their priorities, their working relationships, their attitudes and their ecological relationships to their leadership. Why use the Sommer Survey? When you take on a new job or project, your mind automatically creates a game plan for success. Most of that game plan is out of your awareness, yet it defines the choices you will make on the job. 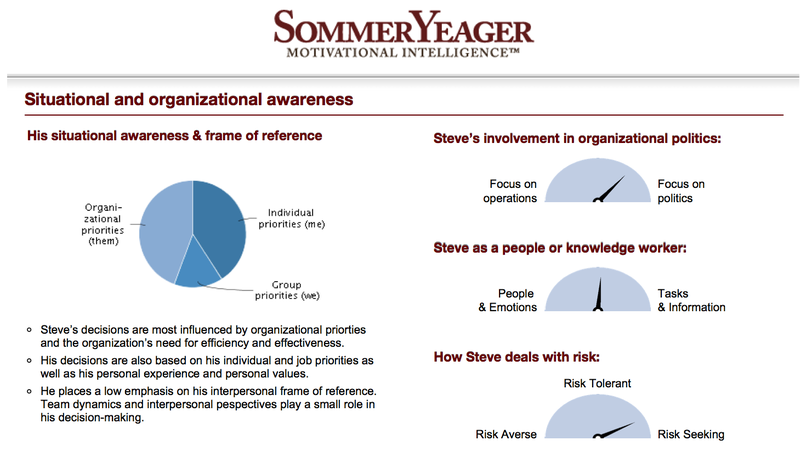 The Sommer Survey is able to accurately grasp someone’s complete decision strategy, providing you with valuable information that allows you to understand, influence or predict behavior on the job. What does the Sommer Survey measure? We compile this information into easy-to-understand reports that give you a complete overview of their conscious and unconscious strategy to succeed at work. Respondents rank 5 sentences according to preference, 42 times. They answer the questions with a particular job or context in mind. Each of their choices indicates a part of their decision strategy. Completing the survey takes about 20-30 minutes and can be done unproctored, 24/7 on any PC, Mac or mobile device with an internet connection. The reports are available within seconds. When is the Sommer Survey used? Our reports offer value whenever it is important to understand, influence or predict the job- related behavior or performance of individuals, teams or even entire organizations. Among others, organizations use us for recruitment & selection, HR marketing & employer branding, onboarding, career mobility, coaching, performance reviews, conflict resolution, team building, team leadership and culture or organizational change projects. Data becomes useful when compared to some known point of reference. The profile information by itself is non-judgmental, all job strategies are potentially successful strategies in some context. The context determines if any given strategy succeeds in a specific job situation. Comparing the profile to the context, such as a “benchmark”, is a key feature of the Sommer Survey’s value.